In software development and product management, a user story is one or more sentences in the everyday or business language of the end user or user of a system that captures what a user does or needs to do as part of his or her job function. User stories are used with agile software development methodologies as the basis for defining the functions a business system must provide, and to facilitate requirements management. It captures the ‘who’, ‘what’ and ‘why’ of a requirement in a simple, concise way, often limited in detail by what can be hand-written on a small paper notecard. User stories originated with Extreme Programming (XP), whose first written description in 1998 only claimed that customers defined project scope “with user stories, which are like use cases”. Rather than offered as a distinct practice, they were described as one of the “game pieces” used in the planning game. However, most of the further literature thrust around all the ways arguing that user stories are “unlike” use cases, in trying to answer in a more practical manner “how requirements are handled” in XP and more generally Agile projects. This drives the emergence, over the years, of a more sophisticated account of user stories. The Confirmation, the more formal the better, ensures that the objectives the conversation revolved around have been reached finally. A pidgin language is a simplified language, usually used for trade, that allows people who can’t communicate in their native language to nonetheless work together. User stories act like this. We don’t expect customers or users to view the system the same way that programmers do; stories act as a pidgin language where both sides can agree enough to work together effectively. User stories are written by or for business users or customers as a primary way to influence the functionality of the system being developed. User stories may also be written by developers to express non-functional requirements (security, performance, quality, etc. ), though primarily it is the task of a product manager to ensure user stories are captured. Agile projects, especially Scrum , use a product backlog, which is a prioritized list of the functionality to be developed in a product or service. Although product backlog items can be whatever the team desires, user stories have emerged as the best and most popular form of product backlog items. While a product backlog can be thought of as a replacement for the requirements document of a traditional project, it is important to remember that the written part of an agile user story (“As a user, I want …”) is incomplete until the discussions about that story occur. It’s often best to think of the written part as a pointer to the real requirement. User stories could point to a diagram depicting a workflow, a spreadsheet showing how to perform a calculation, or any other artifact the product owner or team desires. When the time comes for creating user stories, one of the developers gets together with a customer representative, e.g. a product manager (or product owner in Scrum), which has the responsibility for formulating the user stories. The developer may use a series of questions to get the customer representative going, such as asking about the desirability of some particular functionality, but must take care not to dominate the idea-creation process. A user story is not a specification, but an communication and collaboration tool. Stories should never be handed off to the development team. They should rather be part of a conversation: The product owner and the team should discuss the stories, or even better, write them together. This leverages the creativity and the knowledge of the team and usually results in better user stories. As the customer representative conceives a user story, it is written down on a note card (e.g. 3×5 inches or 8×13 cm) with a name and a brief description. If the developer and the customer representative find a user story deficient in some way (too large, complicated, or imprecise), it is rewritten until satisfactory – often using the INVEST guidelines. Commonly, user stories are not to be definite once they have been written down, since requirements tend to change throughout the development lifecycle, which agile processes handles by not carving them in stone upfront. A Scrum epic is a large user story. There’s no magic threshold at which we call a particular story an epic. It just means “big user story. Stakeholders write user stories. An important concept is that your project stakeholders write the user stories, not the developers. User stories are simple enough that people can learn to write them in a few minutes, so it makes sense that the domain experts (the stakeholders) write them. As its name suggests, a user story describes how a customer or a user employs the product. You should therefore tell the stories from the user’s perspective. Personas : A great way to capture your insights about the users and customers is to use personas. But there is more to it: The persona goals help you discover your stories. Simply ask yourself: What functionality does the product have to provide to meet the goal of the personas.A user persona is a representation of the goals and behavior of a hypothesized group of users. In most cases, personas are synthesized from data collected from interviews with users. They are captured in 1–2 page descriptions that include behavior patterns, goals, skills, attitudes, and environment, with a few fictional personal details to make the persona a realistic character. For each product, more than one persona is usually created, but one persona should always be the primary focus for the design. Use the simplest tool : User stories are often written on index cards as you see in Figure 2(below) Index cards are very easy to work with and are therefore an inclusive modeling technique. Remember non-functional requirements: Stories can be used to describe a wide variety of requirements types. 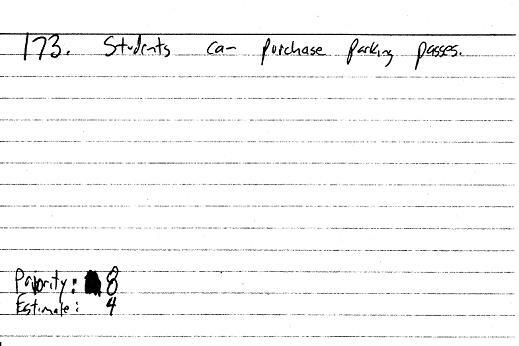 For example in Figure 1(below) the Students can purchase parking passes online user story is a usage requirement similar to a use case whereas the Transcripts will be available online via a standard browser is closer to a technical requirement. Indicate the estimated size: You can see in Figure 2 that it includes an estimate for the effort to implement the user story. One way to estimate is to assign user story points to each card, a relative indication of how long it will take a pair of programmers to implement the story. The team then knows that if it currently takes them on average 2.5 hours per point; therefore the user story in Figure 2 will take around 10 hours to implement. Indicate the priority: Requirements, including defects identified as part of your independent parallel testing activities or by your operations and support efforts, are prioritized by your project stakeholders (or representatives thereof such as product owners) and added to the stack in the appropriate place. You can easily maintain a stack of prioritized requirements by moving the cards around in the stack as appropriate. You can see that the user story card includes an indication of the priority; Agilists often use a scale of one to ten with one being the highest priority. Other prioritization approaches are possible – priorities of High/Medium/Low are often used instead of numbers and some people will even assign each card it’s own unique priority order number (e.g. 344, 345, …). You want to indicate the priority somehow in case you drop the deck of cards, or if you’re using more sophisticated electronic tooling. Pick a strategy that works well for your team. You also see that the priority changed at some point in the past, this is a normal thing, motivating the team to move the card to another point in the stack. The implication is that your prioritization strategy needs to support this sort of activity. The advice is to keep it simple. Optionally include a unique identifier: The card also includes a unique identifier for the user story, in this case 173. The only reason to do this would be to do this is if you need to maintain some sort of traceability between the user story and other artifacts, in particular acceptance tests. Figure 1. Example user stories. Students can purchase monthly parking passes online. Parking passes can be paid via credit cards. Parking passes can be paid via PayPal. Professors can input student marks. Students can obtain their current seminar schedule. Students can order official transcripts. Students can only enroll in seminars for which they have prerequisites. Transcripts will be available online via a standard browser. Figure 2. User story card (informal, high level). A user scenario expands upon your user stories by including details about how a system might be interpreted, experienced, and used. Like user stories, you might imagine several scenarios for each persona group that you anticipate will make up your audience. Your scenarios should anticipate the user’s goal, specify any assumed knowledge, and speculate on the details of the user’s interaction experience. Scheduling. In the agile change management management process where work items, including stories, are addressed in priority order. So, the implication is that the priority assigned to a story affects when the work will be done to implement that requirement. Project stakeholders are responsible for prioritizing requirements. A numerical prioritization strategy is taken (perhaps on a scale of 1 to 20) and a MoSCoW (Must Should Could Won’t) approach is also used. Stakeholders also have the right to define new requirements, change their minds about existing requirements, and even reprioritize requirements as they see fit. However, stakeholders must also be responsible for making decisions and providing information in a timely manner. Estimating. Developers are responsible for estimating the effort required to implement the things which they will work on, including stories. The implication is that because you can only do so much work in an iteration, the size of the work items (including stories), affect when those work items will be addressed. Although you may fear that developers don’t have the requisite estimating skills, and this is often true at first, the fact is that it doesn’t take long for people to get pretty good at estimating when they know that they’re going to have to live up to those estimates. If you’ve adopted the pair programming practice then a user story must be able to be implemented by two people in a single iteration/sprint. Therefore if you’re working in one week iterations each user story must describe less than one week worth of work. Of course, if you aren’t taking a non-solo development approach such as pair programming the user story would need to be implementable by a single person within a single iteration. Large stories, sometimes called epics, would need to be broken up into smaller stories to meet this criteria. Bill Wake introduced the INVEST mnemonic in his seminal post on creating better stories, suggesting they should be Independent, Negotiable, Valuable, Estimable, Small, and Testable. An acute observer of common disconnects between product people and developers, his mnemonic remains an excellent checklist for the creation of high quality product design inputs. Ideally, you should be able to implement your stories in any order while still realizing the benefit of seeing something working at the end. This is important for two reasons. First, you lose a lot of the adaptability agile’s supposed to deliver if your stories have (many) interdependencies. Second, it makes it much more likely you’ll end up at the end of an iteration without working product that you can validate to make sure that you’re moving in a valuable direction. User stories are not requirements A good story is negotiable. It is not an explicit contract for features; rather, details will be co-created by the customer and programmer during development. A good story captures the essence, not the details. Over time, the card may acquire notes, test ideas, and so on, but we don’t need these to prioritize or schedule stories.They’re not another just another template to put on a piece of paper- they’re part of a process where the product person (original drafter) of the stories co-creates a working incarnation of the story with the implementer. This way, the original author gets someone to help them improve/”edit” their story and make sure the story’s interpreted into product in a way that delivers on something Valuable for the user. A story needs to be valuable. We don’t care about value to just anybody; it needs to be valuable to the customer. Developers may have (legitimate) concerns, but these framed in a way that makes the customer perceive them as important. This is especially an issue when splitting stories. Think of a whole story as a multi-layer cake, e.g., a network layer, a persistence layer, a logic layer, and a presentation layer. When we split a story, we’re serving up only part of that cake. We want to give the customer the essence of the whole cake, and the best way is to slice vertically through the layers. Developers often have an inclination to work on only one layer at a time (and get it “right”); but a full database layer (for example) has little value to the customer if there’s no presentation layer. Making each slice valuable to the customer supports XP’s pay-as-you-go attitude toward infrastructure. Stories want to communication information. Don’t hide them on a network drive, the corporate intranet , or a licensed tool. Make them visible instead, for instance, by putting them up on the wall. A great tool to discover, visualize, and manage your stories is a Product Canvas pasted on the wall. It should be possible for a developer with relevant experience to roughly estimate a story. That estimate’s then used by the product person to prioritize their list of stories, taking account of both value and cost (in terms of developer time). Compound stories sometimes hide assumptions, Split compound stories along operational boundaries (CRUD), Data Boundaries. Good stories tend to be small. Stories typically represent at most a few person-weeks worth of work. (Some teams restrict them to a few person-days of work.) Above this size, and it seems to be too hard to know what’s in the story’s scope. Saying, “it would take me more than a month” often implicitly adds, “as I don’t understand what-all it would entail.” Smaller stories tend to get more accurate estimates. Story descriptions can be small too (and putting them on an index card helps make that happen). Alistair Cockburn described the cards as tokens promising a future conversation. Remember, the details can be elaborated through conversations with the customer. Epics are big, coarse-grained user stories. Starting with epics allows you to sketch the product functionality without committing to the details. This is particularly helpful for new products and new features: It allows you to capture the rough scope, and it buys you time to learn more about the users and how to best meet their needs. It also reduces the time and effort required to integrate new insights. A story map is a graphical, two-dimensional product backlog. At the top of the map are big user stories, which are sometimes “epics” as Mike Cohn describes them, and other times correspond to “themes” or “activities”. These grouping units are created by orienting at the user’s workflow or “the order you’d explain the behavior of the system”. Vertically, below the epics, the actual story cards are allocated and ordered by priority. The first horizontal row is a “walking skeleton” and below that represents increasing sophistication. In this way it becomes possible to describe even big systems without losing the big picture. A good story is testable. Writing a story card carries an implicit promise: “I understand what I want well enough that I could write a test for it.” Several teams have reported that by requiring customer tests before implementing a story, the team is more productive. “Testability” has always been a characteristic of good requirements; actually writing the tests early helps us know whether this goal is met. Strive for 90% Test Automation. If a customer doesn’t know how to test something, this may indicate that the story isn’t clear enough, or that it doesn’t reflect something valuable to them, or that the customer just needs help in testing. A team can treat non-functional requirements (such as performance and usability) as things that need to be tested. Figure out how to operationalize these tests will help the team learn the true needs. For all these attributes, the feedback cycle of proposing, estimating, and implementing stories will help teach the team what it needs to know. Continuous requirements prioritization process from the customer‟s scope of vision forms the essential of today‟s agile approaches. An essential feature of any agile approach is an expressed focus on making business value for the customer . Agile software process practitioners deem this approach especially valuable for the software producers in a circumstance that admits extremely uncertain requirements, experimentation with fresh development technology, and customers willing to explore the ways in which developing product can assist their business goals. The continuous prioritization of requirements during the project acts as fundamental role in accomplishing business value creation. Requirements (re)prioritization at interiteration time is the means to align expert decisions to the business strategy that aims the business value. Creating a great user experience (UX) requires more than writing user stories. Also consider the user journeys and interactions, the visual design, and the nonfunctional properties of your product. This results in a holistic description that makes it easier to identify risks and assumptions, and it increases the chances of creating a product with the right user experience. A task communicates the need to do some work. Each team member can define tasks to represent the work that they need to accomplish. For example, a developer can define development tasks to implement user stories. A tester can define test tasks to assign the job of writing and running test cases. A task can also be used to signal regressions or to suggest that exploratory testing should be performed. Also, a team member can define a task to represent generic work for the project. During the Iteration Planning meeting, stories and sometimes defects are broken down into tasks. The tasks are all the work the team must complete to develop, test and accept the story as done. Tasks typically range in size from 1 hour to 2 days, depending on the length of the iteration. Two-week iterations ideally have tasks of 8 hours or less, and four week iterations have tasks sized at 2 days or less. Tasks larger than these guidelines should be broken down further to allow the team to incrementally complete the work and show progress. Keep tasks small. Estimate all tasks in hours. Iteration tracking will be done at story level to keep the team focused on business value. The entire team works together to come up with the tasks for all the stories identified for the iteration. The majority of the tasks are determined during the iteration planning meeting, but in some cases the team may discover tasks as the work starts. It is appropriate to add and/or remove tasks on stories during the iteration. When a task involves an external group – perhaps you want to demo your system to some project stakeholders, or deploy a testable version into your QA/test environment – then you should consider including the task as a reminder to coordinate with those groups. Tasks may include the traditional steps in a development lifecycle (although limited to the feature in question, not the entire product). For instance: Design, Development, Unit Testing, System Testing, UAT (User Acceptance Testing), Documentation, etc. Remember, agile software development methods do not exclude these steps. Agile methods just advocate doing the steps feature-by-feature, just in time, instead of in big phases. At the end of the day , the individuals update the tasks hours remaining for the tasks they have taken responsibility . This will enable to determine the Burn down chart. These are good characteristics for tasks as well. A task needs to be specific enough that everyone can understand what’s involved in it. This helps keep other tasks from overlapping, and helps people understand whether the tasks add up to the full story. The task owner should expect to be able to achieve a task. XP teams have a rule that anybody can ask for help whenever they need it; this certainly includes ensuring that task owners are up to the job. Every task should be relevant, contributing to the story at hand. Stories are broken into tasks for the benefit of developers, but a customer should still be able to expect that every task can be explained and justified. A task should be time-boxed: limited to a specific duration. This doesn’t need to be a formal estimate in hours or days, but there should be an expectation so people know when they should seek help. If a task is harder than expected, the team needs to know it must split the task, change players, or do something to help the task (and story) get done. As you discuss stories, write cards, and split stories, the INVEST acronym can help remind you of characteristics of good stories. When creating a task plan, applying the SMART acronym can improve your tasks. More complicated version that looks something like above. At its core, behavior-driven development is a specialized version of test-driven development which focuses on behavioral specification of software units. finally verify that the implementation of the unit makes the tests succeed. This definition is rather non-specific in that it allows tests in terms of high-level software requirements, low-level technical details or anything in between. The original developer of BDD (Dan North) came up with the notion of BDD because he was dissatisfied with the lack of any specification within TDD of what should be tested and how. One way of looking at BDD therefore, is that it is a continued development of TDD which makes more specific choices than TDD. Behavior-driven development specifies that tests of any unit of software should be specified in terms of the desired behavior of the unit. 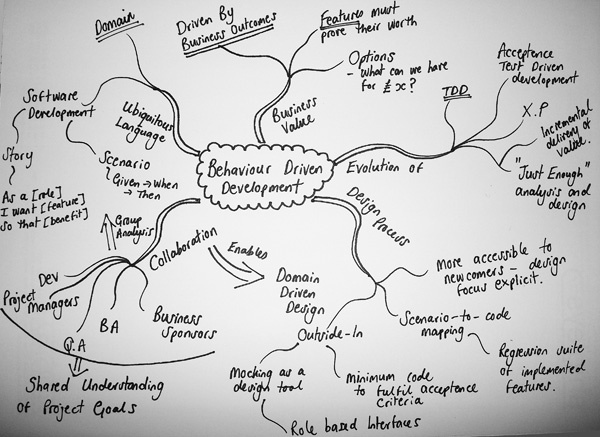 Borrowing from agile software development the “desired behavior” in this case consists of the requirements set by the business — that is, the desired behavior that has business value for whatever entity commissioned the software unit under construction. Within BDD practice, this is referred to as BDD being an “outside-in” activity. Using ‘ensure’ when describing responsibilities of software to differentiate outcomes in the scope of the code in question from side-effects of other elements of code. Domain-Driven Design (DDD) is a collection of principles and patterns that help developers craft elegant object systems. Properly applied it can lead to software abstractions called domain models. These models encapsulate complex business logic, closing the gap between business reality and code. The first piece of production code that BDD developers implement is the UI. Developers can then benefit from quick feedback as to whether the UI looks and behaves appropriately. Through code, and using principles of good design and refactoring, developers discover collaborators of the UI, and of every unit of code thereafter. This helps them adhere to the principle of YAGNI, since each piece of production code is required either by the business, or by another piece of code already written. Behavior-Driven Development (BDD) is an agile process designed to keep the focus on stakeholder value throughout the whole project. The premise of BDD is that the requirement has to be written in a way that everyone understands it – business representative, analyst, developer, tester, manager, etc. The key is to have a unique set of artifacts that are understood and used by everyone. User stories are the central axis around which a software project rotates. Developers use user stories to capture requirements and to express customer expectations. User stories provide the unit of effort that project management uses to plan and to track progress. Estimations are made against user stories, and user stories are where software design begins. User stories help to shape a system’s usability and user experience. User stories express requirements in terms of The Role, The Goal, and The Motivation. 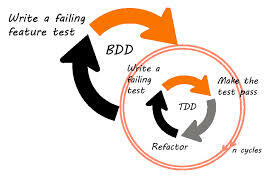 A BDD story is written by the whole team and used as both requirements and executable test cases. It is a way to perform test-driven development (TDD) with a clarity that cannot be accomplished with unit testing. It is a way to describe and test functionality in (almost) natural language. Even though there are different variations of the BDD story template, they all have two common elements: narrative and scenario. Each narrative is followed by one or more scenarios. Even though it is usually very short, it tries to answer three basic questions that are often overlooked in traditional requirements. What is the benefit or value that should be produced (In order to)? Who needs it (As a)? And what is a feature or goal (I want to)? With those questions answered, the team can start defining the best solution in collaboration with the stakeholders. The narrative is further defined through scenarios that provide a definition of done, and acceptance criteria that confirm that narrative that was developed fulfill expectations. Narratives favor verbal communication. Written language is very imprecise, and team members and stakeholders might interpret the requirement in a different way. Verbal communication wins over written. As another example, is the following requirement statement relating to a registration screen: “The system shall allow the user to register using 16 character username and 8 character password”. It was unclear whether the username MUST be 16 characters or whether it could be any length up to 16 characters, or whether it could be any length with a minimum of 16 characters. In this particular case, the business analyst removed any doubt as soon as clarification was asked. when developers take requirements as a final product and simply implement them in a way they understand them. In those cases they might not understand the reasons behind those requirements but just “follow specifications”. They might have a better solution in mind that never gets discussed. system is done in a different order and at a different speed. Writing requirements in this way has many disadvantages: it is error prone and time-consuming, to name but two. Two other important disadvantages are that it is boring and too long to read. This might seem irrelevant until you realize the implications. If reviewers and, if there is such a process, those who need to sign off requirements do NOT read it thoroughly and skip sections out of boredom, or because it does NOT affect them, many things will be missed. Moreover, having a big document written at that level often prevents readers from understanding the big picture and the real goal of the project. A Waterfall model combined with IEEE 830 requirements tends to plan everything in advance, define all details, and hope that the project execution will be flawless. In reality, there are almost no successful software projects that manage to accomplish these goals. Requirements change over time resulting in “change requests”. Changes are unavoidable and only through constant communication and short iterations can the team reduce the impact of these changes. IEEE 830 statements are a big document in the form of a checklist. Written, done, forgotten, the overall understanding is lost. The need for constant reevaluation is nonexistent. Each of those statements can be developed and tested independently and assembled at the end of the process. The first image in someone’s head might be an electrically-powered car. By looking at this narrative, it is clear what the purpose is (enter- tainment for children), who needs it (parents), and what it is (a small-sized car). It does not provide all the details since the main purpose is to establish the communication that will result in more information and understanding of someone’s needs. That process might end with one narrative being split into many. Further on, scenarios produced from that narrative act as acceptance criteria, tests, and definition of done. Anyone can write narratives. Teams that are switching to Agile tend to have business analysts as writers and owners of narratives or even whole BDD stories (a narrative with one or more scenarios). In more mature agile teams, the product owner has a responsibility to make sure that there is a product backlog with BDD stories. That does not mean that he writes them. Each member of the team can write BDD stories or parts of them (narrative or scenario). Even though narratives can be written by anyone, it is often the result of conversations between the product owner or business analyst and the business stakeholder. Scenarios describe interactions between user roles and the system. They are written in plain language with minimal technical details so that all stakeholders (customer, developers, testers, designers, marketing managers, etc.) can have a common base for use in discussions, development, and testing. Scenarios are the acceptance criteria of the narrative. They represent the definition of done. Once all scenarios have been implemented, the story is considered finished. Scenarios can be written by anyone, with testers leading the effort. The whole process should be iterative within the sprint; as the development of the BDD story progresses, new scenarios can be written to cover cases not thought of before. The initial set of scenarios should cover the “happy path”. Alternative paths should be added progressively during the duration of the sprint. Scenarios consist of a description and given, when, and then steps. The scenario description is a short explanation of what the scenario does. It should be possible to understand the scenario from its description. It should not contain details and should not be longer than ten words. Steps are a sequence of preconditions, events, and outcomes of a scenario. Each step must start with words given, when or then. The Given step describes the context or precondition that needs to be fulfilled. The When step describes an action or some event. The Then step describes an outcome. Any number of given, when and then steps can be combined, but at least one of each must be present. BDD steps increase the quality of conversations by forcing participants to think in terms of pre-conditions that allow users to perform actions that result in some outcomes. By using those three types of steps, the quality of the interactions between team members and stakeholders increases. The following process should be followed. 1. Write and discuss narrative. 2. 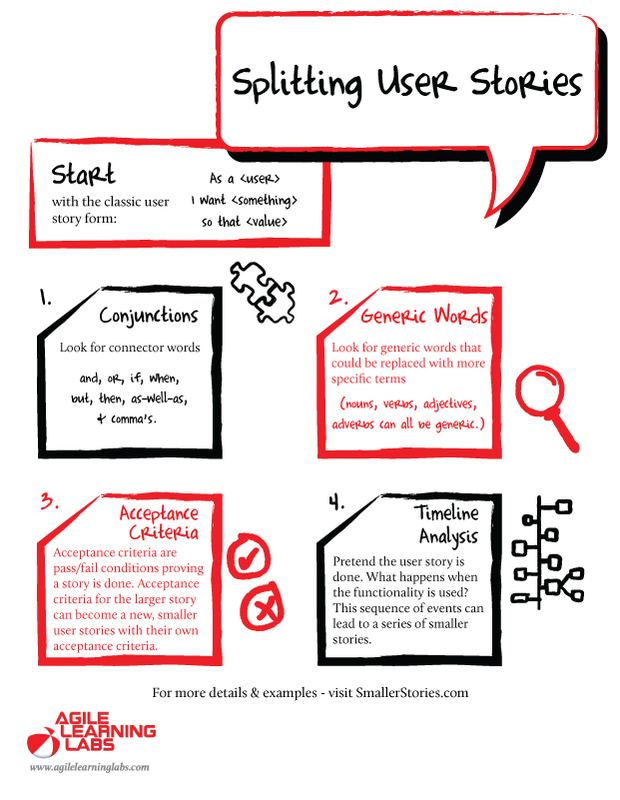 Write and discuss short descriptions of scenarios. 3. Write steps for each scenario. By starting only with scenario descriptions, we are creating a basis that will be further developed through steps. It allows us to discuss different aspects of the narrative without going into the details of all the steps required for each of the scenarios. Do not spend too much time writing descriptions of all possible scenarios. New ones will be written later. Once each scenario has been fully written (description and steps) new possibilities and combinations will be discovered, resulting in more scenarios. Each action or set of actions (when steps) is followed by one or more outcomes (then steps). Even though this scenario provides a solid base, several steps are still missing. This situation is fairly common because many steps are not obvious from the start. Additional preconditions, actions, and outcomes become apparent only after first version of the scenario has been written. copy this scenario and modify it a bit. This scenario was not written and fully perfected at the first attempt but through several iterations. With each version of the scenario, new questions were asked and new possibilities were explored. The process of writing one scenario can take several days or even weeks. It can be done in parallel with code development. As soon as the first version of the scenario has been completed, development can start. As development progresses, unexpected situations will arise and will need to be reflected in scenarios. Behavior-driven development borrows the concept of the ubiquitous language from domain driven design. A ubiquitous language is a (semi-)formal language that is shared by all members of a software development team — both software developers and non-technical personnel. The language in question is both used and developed by all team members as a common means of discussing the domain of the software in question. In this way BDD becomes a vehicle for communication between all the different roles in a software project. BDD uses the specification of desired behavior as a ubiquitous language for the project team members. This is the reason that BDD insists on a semi-formal language for behavioral specification: some formality is a requirement for being a ubiquitous language. In addition, having such a ubiquitous language creates a domain model of specifications, so that specifications may be reasoned about formally. This model is also the basis for the different BDD-supporting software tools that are available. Much like test-driven design practice, behavior-driven development assumes the use of specialized support tooling in a project. Inasmuch as BDD is, in many respects, a more specific version of TDD, the tooling for BDD is similar to that for TDD, but makes more demands on the developer than basic TDD tooling. In principle a BDD support tool is a testing framework for software, much like the tools that support TDD. However, where TDD tools tend to be quite free-format in what is allowed for specifying tests, BDD tools are linked to the definition of the ubiquitous language discussed earlier. The tooling reads a specification document. The tooling directly understands completely formal parts of the ubiquitous language . Based on this, the tool breaks each scenario up into meaningful clauses. Each individual clause in a scenario is transformed into some sort of parameter for a test for the user story. This part requires project-specific work by the software developers. The framework then executes the test for each scenario, with the parameters from that scenario. Dan North has developed a number of frameworks that support BDD (including JBehave and RBehave), whose operation is based on the template that he suggested for recording user stories These tools use a textual description for use cases and several other tools (such as CBehave) have followed suit. However, this format is not required and so there are other tools that use other formats as well. For example Fitnesse (which is built around decision tables), has also been used to roll out BDD. There are several different examples of BDD software tools in use in projects today, for different platforms and programming languages. The theGameIsRunning method reacts to a Given clause by setting up the initial game grid. The iToggleTheCellAt method reacts to a When clause by firing off the toggle event described in the clause. The theGridShouldLookLike method reacts to a Then clause by comparing the actual state of the game grid to the expected state from the scenario. The primary function of this code is to be a bridge between a text file with a story and the actual code being tested. Note that the test code has access to the code being tested (in this case an instance of Game) and is very simple in nature (has to be, otherwise a developer would end up having to write tests for his tests). Finally, in order to run the tests, JBehave requires some plumbing code that identifies the text files which contain scenarios and which inject dependencies (like instances of Game) into the test code. This plumbing code is not illustrated here, since it is a technical requirement of JBehave and does not relate directly to the principle of BDD-style testing. Such a specification may exactly specify the behavior of the component being tested, but is less meaningful to a business user. As a result, specification-based testing is seen in BDD practice as a complement to story-based testing and operates at a lower level. Specification testing is often seen as a replacement for free-format unit testing. This example shows a specification in readable language embedded in executable code. In this case a choice of the tool is to formalize the specification language into the language of the test code by adding methods named it and should. Also there is the concept of a specification precondition – the before section establishes the preconditions that the specification is based on. Cucumber lets software development teams describe how software should behave in plain text. The text is written in a business-readable domain-specific language and serves as documentation, automated tests and development-aid – all rolled into one format. Cucumber works with Ruby, Java, .NET, Flex or web applications written in any language. It has been translated to over 40 spoken languages. Cucumber also supports more succinct tests in tables – similar to what FIT does. Users can view the examples and documentation to learn more about Cucumber tables. Gherkin gives us a lightweight structure for documenting examples of the behavior our stakeholders want, in a way that it can be easily understood both by the stakeholders and by Cucumber. Although we can call Gherkin a programming language, its primary design goal is human readability, meaning you can write automated tests that read like documentation. BDD proponents claim that the use of “should” and “ensureThat” in BDD examples encourages developers to question whether the responsibilities they’re assigning to their classes are appropriate, or whether they can be delegated or moved to another class entirely. Practitioners use an object which is simpler than the collaborating code, and provides the same interface but more predictable behavior. This is injected into the code which needs it, and examples of that code’s behavior are written using this object instead of the production version. These objects can either be created by hand, or created using a mocking framework such as mock. Questioning responsibilities in this way, and using mocks to fulfill the required roles of collaborating classes, encourages the use of Role-based Interfaces. It also helps to keep the classes small and loosely coupled.